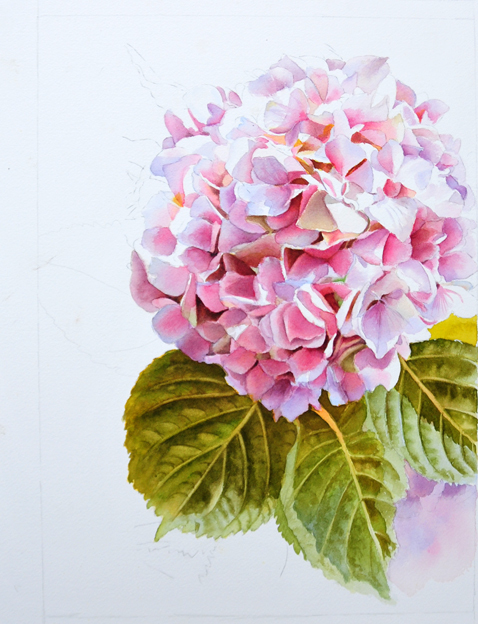 Just wanted to share with you my work in progress ‘Painting of Pink Hydrangea in watercolor’. The flower is mostly finished but I also wanted to start with the leaves. I was so curious to see how it will look together. I am very pleased with the work in progress and I can’t wait to go on. 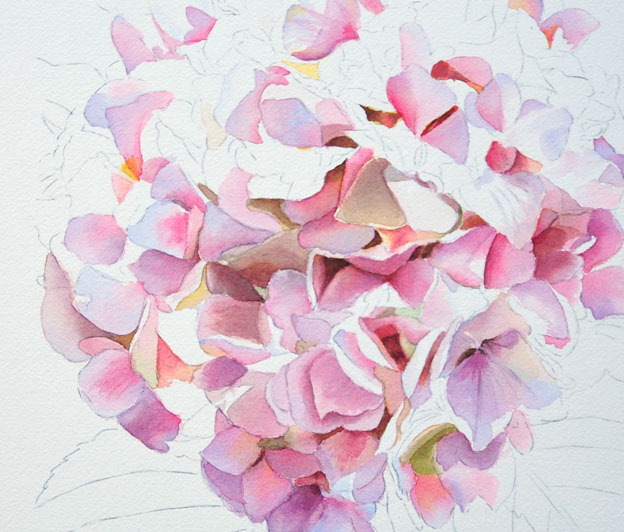 Here I am displaying an early stage of the Pink Hydrangea in watercolor where I still was building all the tiny petals. My basic pink colour is here Permanent Rose from Winsor & Newton. I just love this colour and use it mostly in all pink flowers. But of course the Permanent Rose isn’t used alone. In some areas I mix it with Cobalt Blue to create a shadow, or I mix it with Anthraquinoid Red to warm it up or also with a touch of Sap Green for the very dark areas. Often an underwash of Aureolin (a cool yellow) is needed too. Painting these tiny petals is always a lot of work as each petal needs the same attention as when we would paint large petals. But it is always worth the time. I am using 140 Lb cold pressed Watercolor Paper from Arches.